(U) The Strait of Hormuz is the narrow waterway that allows maritime access into and out of the Persian Gulf from the Gulf of Oman and Arabian Sea. The U.S. Department of Energy (DOE) has identified the Strait of Hormuz as one of six critical chokepoints in the global distribution and trade of oil. The concentration of valuable maritime traffic passing through such a relatively small area makes the Strait of Hormuz a strategic area for the targeting of maritime objectives by groups or nations looking to threaten or disrupt global trade. Iran, located on the north bank of the strait, has made repeated threats to strangle maritime traffic passing through the strait in retaliation for any strike against its nuclear program. In addition, al-Qaeda has reportedly been planning strikes at critical maritime chokepoints over the past decade, including the Strait of Hormuz. Al-Qaeda continues to plan maritime attacks, copying successful tactics from other militant groups such as the LTTE. 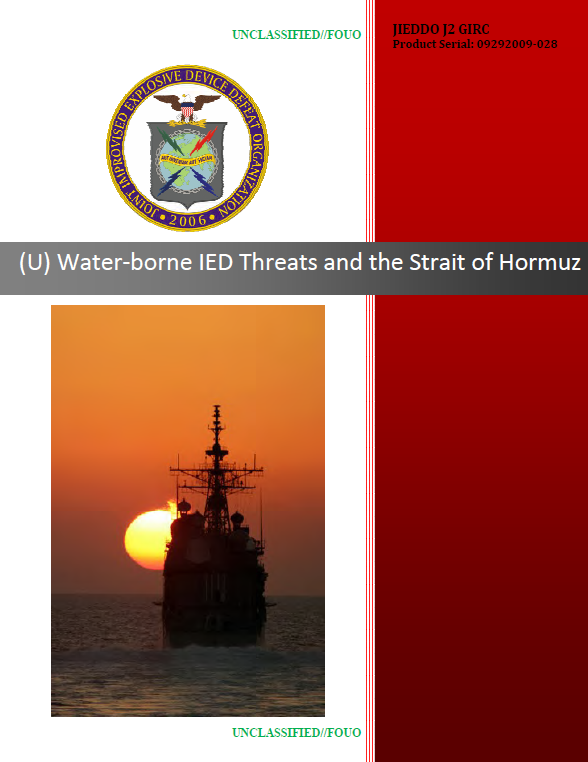 The Strait of Hormuz would be an ideal target for al-Qaeda’s maritime campaign, either through the use of WBIEDs or conventional maritime weapons. (U) The Strait of Hormuz is a narrow channel of water located between Iran, Oman, and the United Arab Emirates (UAE) that connects the Persian Gulf and Gulf of Oman. While the Strait of Hormuz is 21 miles wide at its narrowest point, the navigable space for large vessels is considerably smaller. International treaties have designated a 1-mile corridor for inbound sea traffic and another 1-mile corridor is designated for outbound traffic, with a 1-mile buffer between them. Depths in the shipping lanes typically range from 50m to 80m. The Strait of Hormuz is the only means by which commercial shipping vessels can access the ports in the Persian Gulf. In 2005 over $3.25 trillion worth of international trade passed through the Strait of Hormuz. (U) To date, al-Qaeda has not demonstrated equivalent focus on their maritime terrorism program as they have demonstrated in their land-based terrorism programs. From 1998 to 2002, al-Qaeda’s “Prince of the Sea” was Abd al-Rahim al-Nashiri. A Saudi national, al-Nashiri is a veteran of the Taliban’s fight against Afghanistan’s Northern Alliance in the late-1990s. Later he became al-Qaeda’s Chief of Operations for the Arabian Peninsula, consulting directly with Osama Bin Laden. During his time with al-Qaeda, al-Nashiri masterminded the attempted WBIED attack on the USS The Sullivans (DDG-68) and the successful WBIED attacks on the USS Cole (DDG-67) and MV Limburg. Before his capture in 2002 and subsequent detainment at Guantanamo Bay, Cuba, al-Nashiri’s maritime terrorism plans included ramming rigid inflatable boats packed with explosives against ships, detonating WBIEDs in or near shipping ports, crashing planes into maritime targets, and developing specially trained diving teams. The diving teams were to work as underwater demolition teams, either by covertly placing WBIEDs on maritime targets or detonating themselves as suicide operatives. (U) Reportedly al-Nashiri and al-Qaeda have drawn much of their inspiration for maritime attacks from the success of the LTTE in Sri Lanka. While there is insufficient evidence to support that an official relationship between the LTTE and al-Qaeda exists, there is sufficient evidence of al-Qaeda’s imitation of successful LTTE tactics, including the LTTE’s development of the suicide vest and the use of female suicide bombers. Between 1990 and 2000 the LTTE executed 10 successful WBIED attacks on Sri Lankan naval vessels. These attacks all involved the use of small boats laden with explosives that detonated near the targets’ hulls. The LTTE claims al-Qaeda’s attacks on the USS Cole and MV Limburg were modeled after these earlier missions carried out in Southeast Asia. The LTTE also has a history of successfully using submersibles, diving equipment, and high-speed boats as platforms from which to launch conventional asymmetric maritime attacks, as well as methods for delivering WBIEDs. Recent LTTE attacks include the use of boats as human-operated WBIEDs, as well as the use of SCUBA equipment for stealthily approaching vessels. Using the latter method, the LTTE destroyed a Sri Lankan patrol boat when the suicide bomber detonated a WBIED under the hull.